You’ve heard it before: breakfast is the most important meal of the day. It is what gives you fuel for your day and helps kickstart your metabolism. And, since you won’t be starving by lunch time if you’ve eaten a good breakfast, you are more likely to make healthy food choices later in the day. If you are doubtful, there are plenty of studies which show that breakfast eaters are healthier – like the study which found that people who frequently eat breakfast have lower rates of obesity, diabetes, heart disease, and hypertension. But there is a catch to the whole breakfast-health connection: You’ve got to eat a healthy breakfast if you want to reap the benefits. By loading up on junk food in the morning (like those sugary cereals we love so much), then you can experience a blood sugar spike and subsequent crash. Once your blood sugar comes crashing down, you will feel tired and hungry for more sugary foods. Further, these typical junk food breakfasts consist of only one or two food groups, so they aren’t giving your body the nutrients it needs to sustain itself until the next meal. To make matters worse, many typical breakfasts — like bacon, eggs, and toast — contain too many calories and burden the digestive system. So, you end up feeling weighted down instead of energized for the day. Protein for boosting brain function throughout the day. Protein also helps you feel full for longer. Fiber to help you feel full until lunch time. Low-glycemic carbs to give you fuel without making you feel sluggish or causing a sugar crash. Various fruits and veggies to give you the vitamins and minerals your body needs. Fatty acids (like Omega 3) to help you feel satiated and help oxygen circulation through the body and cell formation. It doesn’t have to take a lot of time to prepare a healthy breakfast which is also tasty. Let’s emphasize the tasty part because who wants to eat a bland boring breakfast? If you want to go with cereal for breakfast, opt for muesli instead of granola. Even the “healthy” granolas are usually loaded with sugars. To give you an idea of just how bad for you granola can be, consider that 1 cup of Quaker Natural Granola Oats & Honey contains 26 grams of sugar and 10 grams of fat! By contrast, a lot of mueslis aren’t sweetened at all because they get their sweetness from dried fruits. To make your muesli even healthier, add some chopped nuts or seeds, unsweetened dried fruit, and a splash of flax oil for your omega 3s. Eating muesli with soy or rice yogurt is also a good way to give your gut some healthy bacteria for the day. Veggie pâté is a staple in my refrigerator. Pâtés can be made with lots of different ingredients and are really versatile. My favorite pâtés are from lentils. I will just throw some lentils, sautéed or steamed veggies, olive oil, spices, and a splash of lemon juice into the food processor. I blend until it is smooth and use the pate on sandwiches or as a veggie dip. If I am in a hurry in the morning, then I spread it one some hearty bread (like Ezekiel bread). To get in some Omega 3s, I will top it with a slice of avocado or splash on some flax oil. I absolutely love my Foreman grill (actually, it is a cheap generic one, but it gets the job done)! When I feel the need for a heartier breakfast but am in a rush, I just drizzle some olive oil and Braggs on some tofu and veggies and then throw them into the grill. While they are grilling, I can do the rest of my morning things. When they are all grilled up to goodness, I eat them with a slice of hearty bread or leftover brown rice, and also some avocado for my Omegas. Obviously, this tastes a lot better if you take the time to marinade the tofu and veggies first the night before. Mix the dry ingredients first. Then make a well in the middle and pour in the milk. Start with 1 cup and then add the remaining if needed (the amount may vary depending on what fruits you use). Mix it just a bit and then add the mashed banana or fruit. Try to mix the batter as little as possible. Mixing causes gluten to form and you will end up with really dense pancakes. 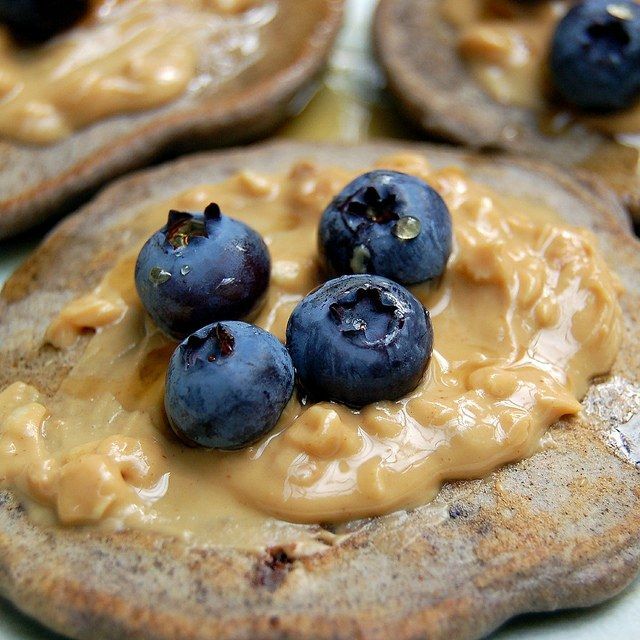 To get your protein in, top these pancakes with nut butter. You can also top them with molasses (great for getting in your iron! ), fresh fruit, or natural jams.